Very interesting news for F1 fans! It was revealed yesterday night (11 Feb.) that Sepang International Circuit (SIC) will be aiming to offer a whole new exciting F1 experience for both new and long-time fans at this year’s upcoming Formula 1 PETRONAS Malaysia Grand Prix, which will be taking place from 27 to 29 March. 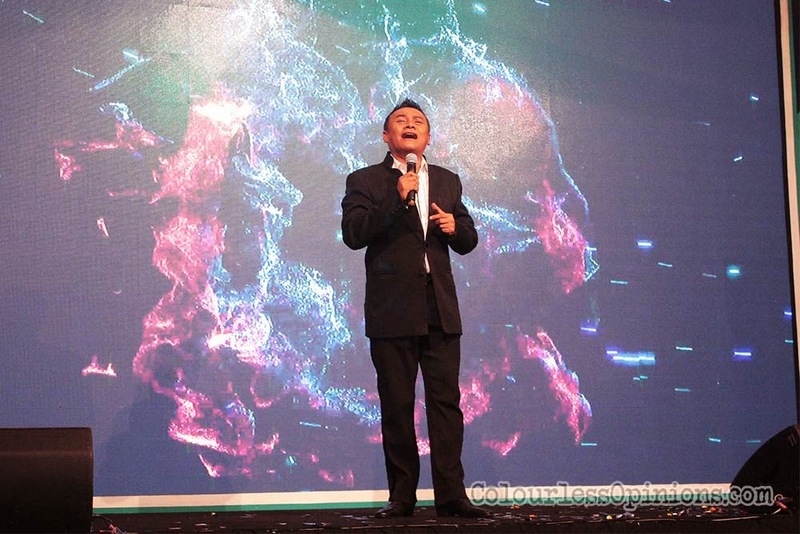 Launched by the Mayor of Kuala Lumpur Datuk Seri Ahmad Phesal Talib at the Symphony Lake Suite KLCC, the invited guests and media got a little taste of how the annual three-day event will be like this time. With this year’s programme themed Experience F1 Like Never Before to encourage families to make the race their weekend outing, the circuit and the grounds will be transformed into a huge entertainment space dubbed ‘F1 Carnival’ where the attendees can expect a family fiesta atmosphere with many off-track activities including fun fair with games, amusement rides, carnival-style attractions, kids and tween zones. karting and drifting at the X-track, shops at the F1 Village, food and beverage festival and many more. The start time of the race on the last day (29 March) will also be earlier this time at 3pm. It will allow an earlier end time for this year’s after-race concert which features multiple Grammy Award-winning retro-style rocker Lenny Kravitz. For the first time ever, all F1 Grand Prix ticket holders will get to enjoy the concert at no extra charge. Additionally, selected activities and the F1 Carnival will also be covered by the tickets which comes with One Ticket Unlimited benefits featuring discounts and promos from various retail outlets and brands in KL. The race weekend will kick off with the Malaysia Grand Prix Gala 2015 on Thursday, 26 March at the Kuala Lumpur Convention Centre featuring a performance by The Jacksons (formerly known as ‘The Jackson 5′ featuring the surviving brothers of the late Michael Jackson). This year’s Gala is in aid of BIDARA, non-profitable charitable organisation with the purpose of improving the quality of lives of the underprivileged and assist those in need and those affected by disasters. The event will start with the red carpet followed by dinner where guests could meet and mingle with some of their favourite F1 drivers. Tickets are priced at RM2,500 (VIP1) and RM2,000 (VIP2). For those who only wish to catch The Jacksons’ concert, tickets priced between RM290 and RM690 are available via TicketPro. The launch event also unveiled a new winner’s trophy for the 2015 F1 Malaysia Grand Prix, crafted by none other than Royal Selangor again. Also present at the launch were SIC Chairman Tan Sri Mokhzani Mahathir, Senior General Manager for Petronas Group Strategic Communications Liz Kamaruddin, SIC CEO Dato’ Razlan Razali and a performance by local music legend Zainal Abidin. “Indeed, we are focusing in the family-theme to draw (Malaysians) out of the living room into the high-octane atmosphere of the circuit itself. F1 fans no longer need to choose between quality family time on a weekend and watching the race. They can now enjoy an outing with their family and friends to Sepang on race weekend itself. (…) It is also interesting to note that the quieter F1 turbo hybird engine introduced last year is contributing to a more kid-friendly F1 race. The lower noise levels appear to be more conducive in (attracting) families,” said Tan Sri Mokhzani. 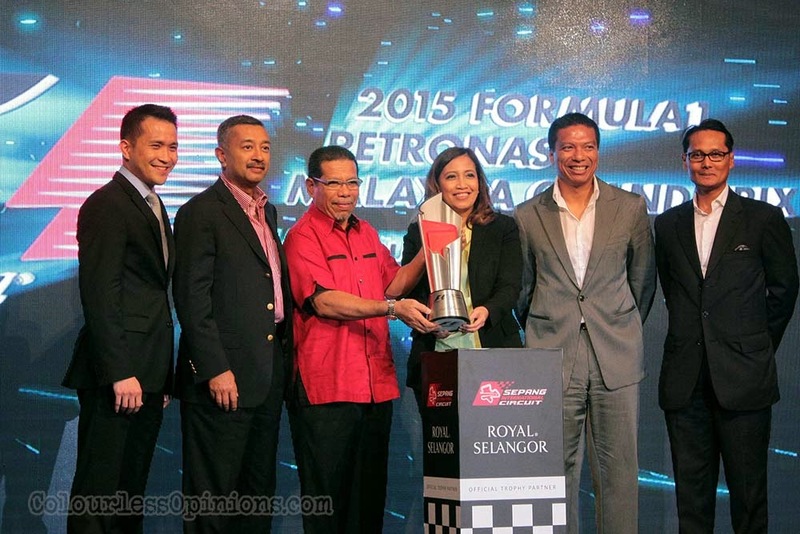 The 2015 Formula 1 PETRONAS Malaysia Grand Prix™ will be the second round of the 2015 FIA Formula 1 World Championship. Ticket price is ranged from RM80 (Hillstand) to RM1,770 (Main Grandstand seats), available now to be purchased from SIC’s website, ticket booth on the Ground Floor of NU Sentral Mall, ticket agents or by calling the hotline +603-8778 2222. Update 26/3/2015: Guess I won’t be going after all. I got invited to this press conference to cover this story but received not further invitations or updates after. Totally disappointed.